We used to write our backups to tape, and have since stopped. Deleting the tapes from catalog removes all the tape backups from the catalog. Awesome! 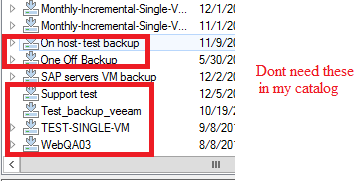 However, I have a number of test jobs and other garbage that have long since been deleted from disk and from the Veeam jobs, that hang out in my catalog. How can I remove these items? Please check out the ability to remove missing restore points from Veeam B&R. Thanks, this is along the lines of what I'm after. However, these jobs do not exist on disk anymore - so I cant follow these steps. Can I do anything via powershell to clear these out? You can use the Forget option — in this case records about missing restore points will be removed from the configuration database (exactly what you're looking for). Hey Foggy, sorry I may be missing something here. 3.In the working area, select the backup and click Properties on the ribbon or right-click the backup and select Properties. I don't have these jobs in my backup list under 'disk' anymore or under Jobs, but they still appear as potential restore points. How can I delete these orphaned entries? Do you mean you see them in the Backups Browser window when performing restore? Please contact technical support to cleanup the database then.